We have just added 50 new items to our Clearance! We will be adding more items to this list throughout the week. Shop now for the best selection. Not Valid on any previous purchases. Prices good through December 31st, 2012 or while supplies last. The inaugural Indianapolis Sister Cities International Festival, organized by the Mayor's Office of International and Cultural Affairs, had all of the right ingredients to show the world. The USYCA/INYCA youth cricket minicamp was one of the major attractions at the NCAA-sponsored “World Sports Park,” where attendees and guests had the opportunity to try their hands at cricket. About four more community events schedule in Indiana during Oct. 2012. (Peter Della Penna/DreamCricket.com) From L-R: Vasu Ram, Sunil Gavaskar, Jamie Harrison, Jatin Patel. On August 18, USYCA and DreamCricket Academy welcomed ICC Hall of Fame inductee Sunil Gavaskar to the DreamCricket facility in Hillsborough, New Jersey. The "Meet The Legend" event was sponsored by MetLife, which also donated gift bags to the adults and signed Sunil Gavaskar mini cricket bats to the chidren. Before the coaching sessions got underway, the audience heard from USYCA President Jamie Harrison, DreamCricket's Kranthi Bayya and Gavaskar, who praised USYCA for its national leadership in youth cricket. Many of the parents in attendance asked Harrison about free cricket sets for their children's schools. Also in attendance were USYCA board members Jatin Patel of Indiana and Vasu Ram of Massachusetts. At the conclusion of the day, Gavaskar took questions from the youth players and posed for photographs. Cricket is the second most popular sport played in the world! It has worldwide popularity and is quickly growing in the United States market as well. Cricket is also a popular sport with the female population, both as a player and a spectator. I would like to discuss the history of women playing cricket. Cricket is one of the oldest sports in history. In fact, there is a report of a women's match played as early as 1745 in England. There is not much information of women's cricket reported from 1745 until 1887 when the first women's cricket club was formed in Yorkshire, England. This club was called the White Heather Club. Soon thereafter, in 1894, a women's club was formed in Australia, South Africa and Canada. From 1926 until 1998 the governing body of women's cricket was the Women's Cricket Association, also called The Association. They governed cricket among women in England, Scotland and Wales. Their main goal was to encourage more women's cricket clubs and encourage women to play after they left school. In 1998 the England and Wales Cricket board took over and are currently the governing body for cricket in those areas. In December 1934 the first international women's test cricket match was played between England and Australia. In 1958, the IWCC (International Women's Cricket Council was formed to merge all women's team from around the world. In 2005, IWCC merged with the ICC (International Cricket Council) so that the ICC now the governing body of cricket for women, men and youth. There is a Women's World Cup. This started in 1973, interestingly two years before the first Men's World Cup. Fifteen countries/teams have played in the Women's World Cup thus far and there have been eight total since 1973. Amoung them are; England, India, New Zealand, Australia, South Africa, West Indies, Sri Lanka, Pakistan, Jamaica, Denmark, Ireland, Netherlands, Trinidad and Tobago. The United States has yet to play in the Women's Cricket World Cup. Today, cricket is very popular among women in England. England and Australia have the strongest teams. There is an effort to make cricket a more popular sport for American women but funding and other metrics have made it hard to move forward with teams. Hopefully, as cricket awareness grows in the US, due to the strong youth effort and number of immigrants who now reside in the United States this will soon change. Cricket is the number two most popular sport in the world. The sport is quickly making an impressive comeback in the United States, especially youth cricket which has spread quite quickly over the past 4 years. So most would agree that finding the most updated, relevant information regarding Cricket would be imperative to cricket fans! I would like to discuss where the best sources for cricket news is today. Ill start with United States cricket. The USACA, United States of America Cricket Association, is the governing body of cricket in the US. The web address is USACA.org. On this site you will find updated news such as; tournament schedules, team captain announcements, new teams formed and information regard any elections or committee updates for men, women as well as youth. The site however does not have a lot of information and if you are looking for up-to-date scores it is lacking. The United States Youth Cricket Association, usyca.org, site actually has much more information regarding announcements of youth cricket around the country and also has contacts of the youth cricket clubs so if you are looking for a specific region and contact you can easily find it on this site. For updated scores, tournament news or any other United States cricket news the best site for sure is the ESPNcricinfo.com site. On the cricinfo site, you can also find all players, players stats, a list of top cricket bloggers, yearly and team statistics and much, much more. I would definitely think one could get any information requested from this fact-filled website. Now if your passion is cricket and one is trying to in find cricket news fro around the world, there is a multitude of excellent sites to choose from. ESPNcricinfo does have all cricket news, scores, events and statistics for every country you can imagine. Also Yahoo Cricket, cricket.yahoo.com, is an excellent source for all things cricket. I also think it is an extremely user-friendly site and easily navigable. Lastly, cricket365.com is very helpful for a cricket fan to get up to date stories, news and scores. In conclusion, there are many great sources for cricket information on the web. I suggest switching between the above resources to figure out which best meets your particular needs. Some have access to receive live feeds and social media sharing and others just typical old fashioned good articles. The good news is the resources are available! There have been many excellent cricket batsmen to play the game over time. There is much speculation about what makes a player the top batsmen, is it most runs, highest average, a combination of both? Today I would like to discuss who I feel the top batsmen of all time are mostly by average as this represents consistently but also a combination of other factors. At number ten, we have Jacques Kallis, also known as JH Kallis. Kallis is an active player and currently has a batting average a little under 58. Jacques is a right-handed batsman from South Africa, who has primarily played for the country of South Africa. There is great promise that Kallis could be greater than number 10 as he is currently only 36 and could have a few more great years of cricket still in him. At number nine we have a man who played for the West Indies named Garfield Sobers. Sobers played cricket from 1954 until 1974 and ended his career with a batting average of 57.78. Sobers ended his career with a very impressive 8064 runs. At number eight we have Wally Hammond with an average of 58.46. Hammond played from 1927 until 1947 for England. In the number seven spot we have a man named Everton Weeks. Weeks had an average of 58.61 but what was most impressive is his career was quite short for a cricketer, only ten years. He played for the West Indies. The batsman with the sixth highest record is England's Ken Barrington. Barrington's average was just a little above Weeks at 58.67. His career was thirteen years long ending in 1968. At number five we have an English cricketer names Eddie Paynter. He had a very impressive record of 59.23 in just eight years of playing. The number four player is a man named Herbert Sutcliffe. Sutcliffe, an English cricketer, played from 1924 until 1935 and finished his eleven-year record with a batting average of 60.73. The third best batsman is George Headley. He finished his career in 1954 with a batting average of 60.83. Headley played cricket for the West Indies. The second best batsman of all time is another South African named Graeme Pollock. Pollock's batting average was 60.97 and he played for just seven years. In those seven years he managed to have 2256 hits. The top batman in cricket of all time is a man named Donald Bradman, also known as Sir Donald Bradman. Bradman played for Australia from 1928 until 1948. In that time he had 6996 hits and an unheard of batting average of 99.94. He has been retired from the game for almost 64 years and still no cricketer has even come close to touching his amazing records. And there you have it, the most talented cricket batsmen of all time. The newest cricket players have quite a bit to live up to with such amazing past cricket batsmen. The question is do you think anyone can beat a record of over 99%? Nor do I. Why Should American Children Play Cricket? Cricket, the world's second most popular spectator sport, can provide a fun way for children of all ages to stay or get in shape. Cricket improves speed, agility, flexibility and reflexes; it increases concentration, the ability to think strategically and to utilize decision-making skills. Cricket also, unlike what most children are exposed to in most American sports, prizes sportsmanship and fair play - self control, integrity and respect for others is central to the game of cricket. Many children who are reluctant to take part in team sports find themselves well suited for cricket. Everyone who plays cricket can expect to experience physical benefits. For example, sprinting between the wickets provides an excellent aerobic workout. Cricket shares some basic foundations with some of the martial arts (or even dance and music for that matter!). Some examples of these: measure, tempo change, timing, velocity, and proper execution and simplification of technique. Therefore, children can associate the learning from one subject or skill set to another, linking the common ground to broaden their life perspective. Cricket is an excellent mental exercise. Any cricketer who makes a serious effort to learn the game cannot help but develop greater powers of observation and a greater understanding of strategy. A cricketer, at the game's top levels, must learn to develop a complete repertoire of shots (if one is a batter) or variations in bowling (if one is a bowler), and learn how to judge and determine their opponent's thoughts and character so as to anticipate their actions. The cricketer must learn to use this ability to entice or draw an opponent into making a mistake, by leading them into thinking that they are in control of the contest. Cricketers often become friends and competitors, finding themselves meeting hundreds of people over the years as they travel to competitions locally, nationally, and internationally. Not surprisingly, cricket is the fastest growing sport among universities across Canada and United States. Very skilled players may have the opportunity to train overseas, compete in prestigious tournaments, which in the future may also include the Olympic Games. What Will Cricket Do For Your Child? Because cricket is always FUN! Cricket bridges gaps between sexes, sizes, ethnicity and personality (as is seen when both young girls and boys defeat an opponent with technique and timing when confronted with brawn and bulk!). Cricket is a great way to develop a child's mind, body and spirit, helping to lay the foundation for success as an adult! It can be played indoors or outside, on a basketball court, asphalt or grass. It allows the instructor to observe students both as individual participants and as parts of a team. Cricket rewards patience, technique and intelligence; stature has very little to do with eventual greatness. This encourages all children to participate, and draws out those typically disaffected. Cricket is suitable for boys and girls to participate in from an early age. 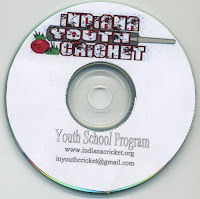 Children from the age of 5 years old can begin to learn cricket by participating in the USYCA program. Cricket is a non-contact sport and at this age is played with a soft cricket ball to ensure the safety of the children. Cricket is a great way for children to learn to work together in a team environment while developing important physical and mental skills. Boys and girls of all ages can play cricket both socially and competitively. While competitive cricket is mostly played on a pitch on an oval field, cricket just for fun can be played in backyards, parks, and streets or on the beach. To play backyard cricket you just need some friends, a bat, a ball and wickets. To learn the skills, children can participate in a clinic, or join a local youth league. The object of the game is to score more runs than the opposing team. One team fields while the other team is the batting side. The fielding team bowls the cricket ball at the batsmen who tries to hit the ball with their bat. The fielding team is trying to get the batsmen out while the batting team is trying to score as many runs as they can without getting out. When the two batters cross over to each other's wicket, they have scored one run for their team. Batters may run on any ball whether it is hit or not. Off each delivery a batsmen can score 0 through to 6 runs. If a ball is hit to the boundary along the ground it is worth 4 runs. If a ball is hit over the boundary it is worth six runs. When the batting team has only one player remaining that is “not out” they must switch around and become the bowling team. This weekend save 10% on ALL Aero Cricket Equipment! There are many different cricket bats to choose from. When first looking to buy a new cricket bat you have to decide price range, brand and then of course English or Kashmir Willow. Today I want to discuss English Willow and different levels of willow grade to help you decide which is best for you. Let's first discuss a few details about English Willow because this is the most popular choice for cricket bat material. English Willow comes from the English Willow tree also called, Salix Alba Caerulea tree and most of them are found in various parts of England. They must mature for no less than 4 years before they are cut down for use in bat making. English willow is the best quality one can buy. The wood from English Willow is straight-grained and the grading is based upon flaws and the other things mentioned below. A Grade 1 is the most alluring blade, though it may not necessarily play the best. There may be some red wood evident on the edge of the bat. The grain on the face will be straight and there will be at least 4 grains visible. It can have an odd small knot in the edge or back but not on playing area of the bat. A Grade 2 blade is also very good quality and in grade 2 one can typically expect a larger amount of red wood on the edge of a bat, this has no effect on the playing ability of the bat it is purely cosmetic. Again there will be at least 4 straight grains on the face of the bat with maybe some blemishes, pin knots or small specks that are visible. Grade 3 is the grade produced and sold most and it's an economical and good quality for money. A Grade 3 Blade has up to half colour across the bat and is therefore sometimes bleached, again this has no direct relation to the playing ability of the wood, and it just has less visual attraction. This grade will also have at least 4 grains on the face of the bat but they may not always be perfectly straight. Furthermore, it will contain more prominent specks and of course butterfly stains. A Grade 4 Blade is normally bleached to cover up the discoloration, which typically covers over half the bat. The Grade 4 still plays quite well. It will most likely have multiple specks or butterfly stains in it. In conclusion, when choosing your new cricket bat, make sure you are doing your research first. Quality is very important in this matter as you will hopefully keep the same bat for many years. To refresh the positions, there's the front foot strokes and back foot strokes. A batsman can change this position based on how the ball is thrown and where it is going. Front foot strokes are when the batsman's front foot stretches down the pitch toward the bowler and his weight is on the front foot. A back foot stroke is when the batsman's back foot is pushed back toward the wicket and his weight on his back foot. The first to reference is the back foot defensive. This stroke is very similar to the front foot defensive only the weight is placed on the back foot. This stroke is typically used to defend the wicket instead of scoring. The main difference between the front foot and back foot defensive is that in the back foot defensive the ball can bounce higher and be reached a bit later because the weight is placed on the back foot. Next is the stroke titled Cut. The Cut is an aggressive attack on the ball designed to hit the ball far and score runs. The bat is swung in a horizontal arc to the ground. With this technique the batsmen's swings right after the ball has passed the batsmen's body and in some cases quite awhile after it has past the batsmen's body. This is a technique that typically only the fairly skilled attempt. The Pull is another type of aggressive cricket batting technique where the bat is pulled in a horizontal arc. It is called The Pull because the intention is to pull the ball to the leg side and score runs. This can also be a risky swing but also effective if used properly. The hook, another aggressive technique, is a more difficult stroke. The intention with the hook is to hit the ball so high and far that you score 6 runs. The Hook uses a diagonal arc and is hit when the ball is about as high as the batsman's head, because of this it can be dangerous. The last swing is the leg glance. The leg glance is not an aggressive shot and is actually rather subtle. The ball is hit on the side or around the batsmen's leg. In conclusion, there are many different techniques for cricket batting. You should try them all to truly understand them. Once you have familiarized yourself more with the game, you will understand which stroke is appropriate at what time. The United States Youth Cricket Association is pleased to announce that Reebok Cricket has signed a three-year agreement to become the organization's Official Apparel Sponsor. "USYCA welcomes this important partnership with Reebok Cricket," said USYCA President Jamie Harrison. "Reebok's leadership in the global cricket marketplace is well-established, and USYCA is proud to be associated with the Reebok brand. "Reebok's sponsorship of USYCA is the first of its kind for an international sports brand in the United States cricket market, and thus continues the USYCA tradition of changing expectations for cricket in America," said Harrison. For USYCA, the agreement will ensure that the organization's growth, and its ability to impact youth cricket development, will continue its dramatic pace. "The funding derived from this partnership will help to further the expansion of youth cricket in the United States for years to come," Harrison said. "The bar has again been raised, and USYCA, working together with Reebok, looks forward to an exciting future." "Reebok is proud to support USYCA and youth cricket in America," said Sai Vajha, Head of Cricket for Reebok North America. "The success of USYCA in developing cricket has set it apart, and Reebok is eager to join with USYCA in growing our great game in the United States." In addition to the financial components, Reebok will produce official USYCA licensed apparel, which, along with other Reebok apparel and equipment, will be made available through a web portal on the USYCA homepage. Reebok is also an official supplier of apparel to Sri Lanka, Canada and Zimbabwe national cricket sides, as well as several teams in the Indian Premier League. Reebok International Ltd., headquartered in Canton, Massachusetts, is a leading worldwide designer, marketer and distributor of sports, fitness and casual footwear, apparel and equipment. A subsidiary of the adidas Group, the company operates under the multiple divisions of the Reebok brand, Reebok-CCM Hockey and the Sports Licensed Division. For more information, visit Reebok at www.reebok.com. 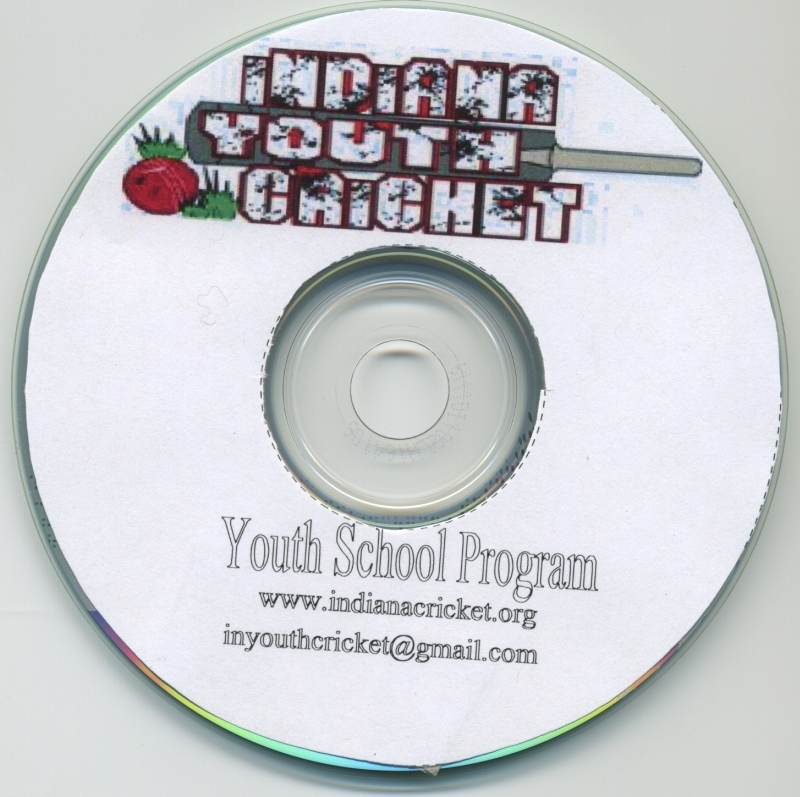 The United States Youth Cricket Association (USYCA) is the largest organization in the United States devoted to the promotion of the game of cricket among young people and is a tax-exempt organization under section 501(c)(3) of the Internal Revenue Code. For more information, visit USYCA at usyca.org. Ponting retires, Is Sachin next? Are Cricket Sets a Good Purchase? 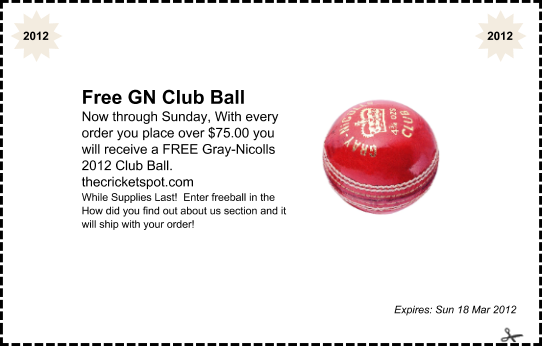 There are many cricket products out there to purchase. It can be overwhelming when you are trying to decide what you should or shouldn't buy and what might be necessary. I wanted to discuss cricket sets and whether or not they are a useful item to buy. Let's start out by talking about what most cricket sets contain. Looking at the major players; Kookaburra, Gray Nicholls, Gunn and Moore, it seems that most cricket sets contain a cricket bat, cricket ball, stumps and a carrying case for all of it. A cricket bat and a cricket ball are both obviously very useful tools when playing cricket. Throw in the cricket stump and all you need to do is find a few players, with their own cricket kit of course, and you have all you need for a pickup game of cricket. A cricket bag to hold them all in seems to add convenience. Also, it is noteworthy that some sets contain more than one bat, stump and ball. The price is the next thing to consider. Most cricket sets I have seen range from $20 to $300. As far as cricket equipment goes, this is a very reasonable price for a bat alone and you are getting a bat, a ball and a cricket stump as well as a bag or carrying case to put everything in. So I would say it is a very good bargain. Many of the sets priced less than $50 are geared toward youth players and are offered in smaller sizes. The quality of the products inside the set can vary a bit. The lesser-priced sets are obviously not as high quality as the more expensive ones. Sets vary from plastic materials to Kashmir Willow bats and wooden stumps to even English Willow Bats. And the price will reflect the quality of the materials used to make the set. The next thing to ponder is who is the cricket set for? Is the set for a beginner? Is it for a youth? If the answer to either of these is yes than I believe that a cricket set is a great purchase for you. I would start with a plastic or Kashmir Willow set until you have enough experience to decide what type of bat is the best fit for you. In conclusion, I believe that cricket sets are a great option for many people. As with any purchase, you must make sure to do your homework first and make sure the set you get is a good fit for you. Good Luck and Happy Cricketing! Cricket is a very unique sport however; it can be confusing to someone who is more familiar with a simpler sport. There are a lot of rules that just plain need to be memorized or rehearsed. There is also many different ways a batsman can choose to hit the cricket ball. This mostly depends on the batsman's style and how the ball is being bowled to the batsman. I would like to explain some of the different strokes a batsman commonly uses. To start with you have front foot strokes and back foot strokes. A batsman can change this position based on how the ball is thrown and where it is going. Front foot strokes are when the batsman's front foot stretches down the pitch toward the bowler and his weight is on the front foot. A back foot stroke is when the batsman's back foot is pushed back toward the wicket and his weight on his back foot. There are many shots or strokes that a batsman can use within these two categories and I am going to discuss front foot strokes below. The front foot defensive is a stroke that is played by moving the front foot toward the pitch, keeping the back foot still. The cricket bat is brought down in a vertical line in a blocking motion. The purpose of this stroke is mostly to defend the wicket from being taken. The front foot Drive, or the drive, is a stroke where the footwork is similar to the front foot defensive but the intention is to drive the ball. So the swing is a vertical arc motion with the bat angled downwards. This stroke is designed to defend the wicket and score runs both. There are a few different types of drives strokes to mention. On Drive hits the ball in the direction of the fielding position mid on. Off drive does the same but to the fielding position of, yes you guessed it, mid off. The cover drive is hit in the direction of the cover and the square to the direction of the wicket. A lofted drive does exactly as it sounds, lofts into the air, by angling the bat upward. Lastly, we have the sweep and the reverse sweep. The sweep is when a batsman receives a slow moving pitch and the batsman kneels to reach the ball. The bat is swung horizontally in an arc. A reverse sweep is rare, not often seen but is similar to the above only the bat is turned in reverse. Both of these strokes are used only with slower bowlers. Isn't it time for some new Cricket Shoes? Clive Lloyd, West Indies: It is a given that he has to be one of the best World Cup captains if not the best. He led the side to two World Cup wins and one other final, which they would have won had it not been for a rash display of overconfident batting. To add to that, he was an excellent fielder and scored a century in the final of one of the World Cups that his side won. His presence was so vital to the side that post his retirement, West Indies have entered the semi-final of the tournament only once in the remaining seven tournaments. Ricky Ponting, Australia: > Another two-time World Cup champion who has also been a part of the side under another leader on two other occasion. He will have the chance to make it three in a row as a captain of the side when the 2011 edition of the World Cup comes around but even without that, he led the side to two comprehensive World Cup wins – without dropping a single game. Steve Waugh, Australia: > He won the 1999 World Cup for the side but the best part about him was that it was done against a run of play. Australia were never deemed to get to the semi-final let alone win the tournament after the kind of start that they had to the tournament. But a Steve Waugh century in what was the decider that allowed them to the semi-finals followed by a pulsating win over South Africa in the semi-final led them to the 1999 World Cup titles. Kapil Dev, India: Kapil’s Devils, they were called. And devils they were, as they plucked West Indies, Australia, England and then West Indies again in the final to clinch the World Cup. And if one may add, against all odds. Of all the teams that have won the World Cup, India’s odds to do so were the longest and they had gone into the final at 66/1 to do so. Against West Indies, Kapil scalped a couple of wickets, took an excellent catch to dismiss Vivian Richards and won the final. Imran Khan, Pakistan: Pakistan were down and out in the 1992 World Cup. They had been bowled out for 74 against England in another appalling batting performance and looked to be headed out when divine intervention in the form of rain stalled their defeat. The rest, as they say, is history. They managed to get to the semi-finals thanks to that extra point obtained from that abandoned game and won two successive games to win the tournament. Imran did everything, bat, bowl and get his team up to the morale that they had – all with a back injury. This is a fantastic, up and coming line of Cricket gear that we are happy to sell at The Cricket SPot. here's a little bit about this line. The line was started way back in 1931 but of course didn't become popular until 1987 when Sunil "Sunny" Gavaskar scored 10,000 with yes an SG bat. The legend is still behind the product range from SG titled Sunny (bats). SG today is the world LARGEST manufacturer of cricket gear! It is made BY cricketers for cricketers. Check out all of our SG cricket gear here -- and yes most of it is BRAND NEW 2012! Kookaburra Deals of the Week! We are hoping to get Kookaburra new 2012 stuff VERY soon therefore, we are marking down some of our popular products to make room:) Here's a link to the Deals of the Week! Who's Omitted from the South Africa squad? Fantasy Sports are some of the most popular pastimes for both men and women around the world. In the United States alone over 32 million people play some form of the hobby. A fantasy team is a team that an individual constructs based on their favorite players from all teams; this is called their draft or fantasy draft. Than each player (or team) play other fantasy teams, or people, for the entire season to see who has chosen the best team from all of the top players. Each sport has a scoring system that can vary from sport to sport and from different leagues or websites, but in all leagues the idea is to gain the most points. In any event, it is very enjoyable and can be a monetary bonus for some players. Let's talk a little about the history of fantasy sporting and leagues. Fantasy sporting started a little after World war two but wasn't very popular until 1976 when a draft league started at Glassboro State College. Around that same time a student named Okrent learned about the game from his professor and began a league with his friends. Okrent, a writer, has been credited with inventing fantasy sports because of his public writings in his newspaper, The New York Times. The first fantasy leagues were primary baseball. Today the most popular fantasy sports are football (American, and Australian), Cricket, baseball, hockey, golf, basketball and auto racing. Players, or leagues, typically meet and choose their teams together. Once a player, no matter what position or team he may be from, is picked another fantasy player cannot choose him or her. With the Internet being so popular today, online fantasy games and teams are becoming far more popular. There are many free sites to play fantasy leagues on and in places where gambling is legal, you can even win money. In fantasy cricket, it is quite simple and much like all other fantasy leagues. The main idea in fantasy cricket is to choose the unsurpassed order of the bowlers, batsmen and all-rounders. There are cricket fantasy leagues for One Day International cricket, test cricket and Twenty 20 cricket. In fantasy cricket you will choose 11 players and 3 substitute players, which can be any number of batsmen, bowlers or all-rounders. In conclusion, fantasy sports of any kind can be a blast for anyone to play. I suggest you read your stats, get creative and pick your team. Then have fun watching as many matches as possible and watch your points add up. To first define cricket, cricket is a game played with two teams, eleven players on each team. All forms include cricket bats, a ball and wickets. A run can be scored a few ways but most commonly when a batsman hits the ball and then runs to the other end of the cricket pitch and crosses the crease. The first type of cricket I want to discuss is Test Cricket. Test is considered the original form of the game; Test Cricket matches date back to the late 1800's. Test games last five days and have no limit to how long each side can bat. Test Cricket is played only between national opponents and there are currently ten teams that participate in Test Cricket they are Australia, Bangladesh, England, India, New Zealand, Pakistan, South Africa, Sri Lanka, West Indies and Zimbabwe. Test is considered the most athletic of all of the games because of the length and amount of games played. Also, a Test game can result in a tie or a draw. The next two I want to deliberate are One Day Cricket and Twenty20 Cricket. One Day is self-explanatory; it takes just one day to play. The other difference between One Day Cricket and Test Cricket is that each team only bats once and the limit to overs is typically set at fifty. Twenty20 Cricket has only been around since 2003 and was developed in the United Kingdom. It is a form of One Day but has modified rules from the One Day. The major difference is that in Twenty20 has a limit of 20 overs versus 50 overs in One Day. Both of these forms always end with a result. Although 20Twenty is becoming popular, One Day still remains the most popular among cricketers. Although Test Cricket, One Day Cricket and Twenty20 Cricket are by far the most popular here are some other forms of the game. There is Beach Cricket, which is of course played on the beach. Beach Cricket is very different from other forms because it has different rules and it is played on the beach, but it is played purely for fun. Indoor Cricket is another form of cricket. Indoor Cricket is played much the same as other forms of cricket but indoor, this is a good option for cricketers who live in areas where the weather is sometimes too hot or too cold for outdoor sports. Kwik Cricket is for children. There are different forms but usually Kwik Cricket is played with plastic balls and bats. And the most popular type of cricket for amateur cricketers is Club Cricket. Club Cricket is played very similar to other forms of the game but is a very social event. How will this affect the team? I have just added more 2012 products to www.thecricketspot.com. 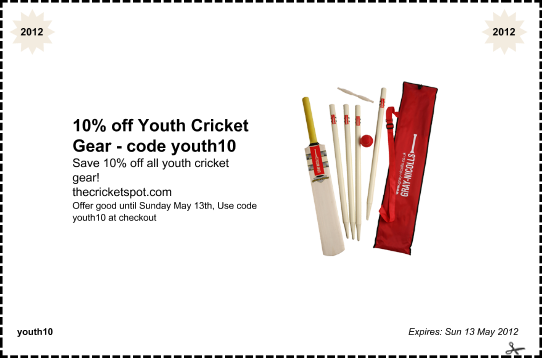 Here you will find some Gray-Nicolls balls, stumps and accessories. A handful of SG bats, batting gloves and youth products! I will continue to add more 2012 products all week. If you have a specific item you are searching for, please contact us to see if we can carry it. Are you as excited as I am for new 2012 matches, and to see who is leading the ways?